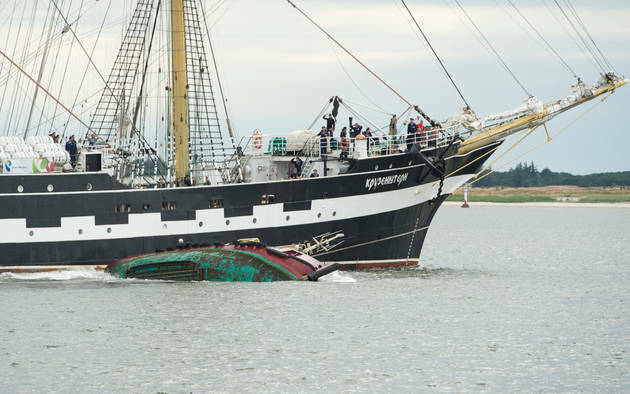 The 17 meter long tugboat Diver Master capsized and sank near Fanö Island off Esbjerg, Denmark. 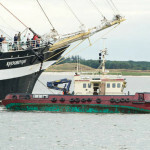 The tug was assisting the 115 meter long, 1645 dwt four-masted barque Kruzenshtern out of the harbour along with the tug Svitzer Helios. 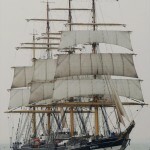 The Kruzenshtern was to let go the two hawsers, one attached to each tug. One slipped free while the other became stuck. 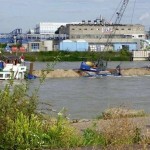 The line pulled the Diver Master down towards the Kruzenshtern flooding the vessel. 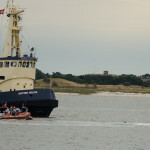 A water police boat was nearby and two of the three crew on the Diver Master were able to leap to safety. 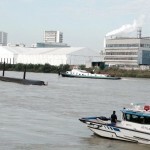 A third crewman fell into the water, but a line was secured to him to avoid being pulled under. The Diver Master capsized and later sank in 10 meters of water. Authorities have monitors over the wreck site monitoring for pollution. 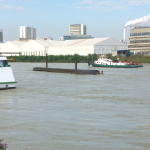 The tugboat had some 3000 litres of fuel on board at the time of the sinking. 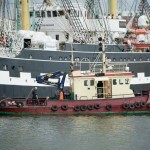 Reports state the tug sank in the middle of the fairway obstructing traffic to and from the port of Esbjerg. 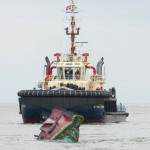 A salvage team is expected to raise the tug by the following week. 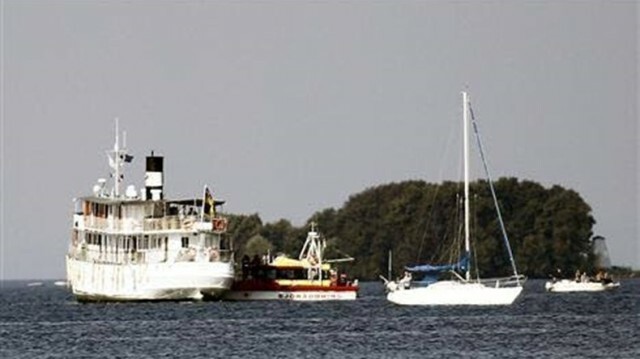 The 31 meter long passenger ship Juno ran aground on Lake Vattern off Råssnäsudden, Sweden. 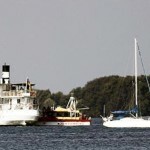 The Juno was underway from Motala to Karlsborgsvagen with 29 passengers when it ran aground on the wrong side of the channel. No reports of injuries. A lifeboat was dispatched to the scene and help evacuate passengers off the Juno. 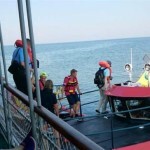 The passenger ship was later refloated and proceeded to Motala where divers inspected the hull. No reports of damage or pollution released. 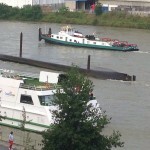 The 52 meter long self-propelled dreger-barge Merlin capsized on the Rhine River in Basel, Switzerland near the port of Kleinhüningen. 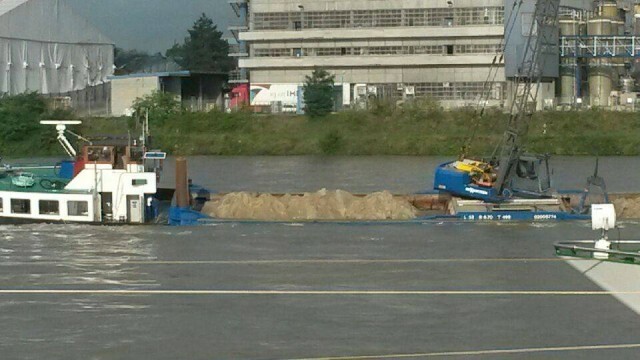 The Merlin was loaded with gravel when it became destabilized and capsized. 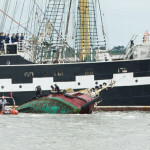 The 4 crew on board were able to abandon ship before the vessel overturn with its keel out of the water. 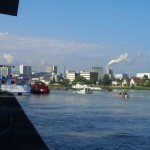 The crew were rescued by firefighters and water police. 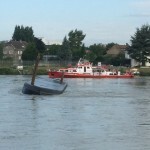 The Merlin, pulled by the strong current, drifted into the side of the passing passenger ship Olympia. 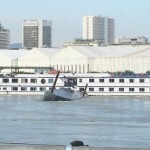 The Olympia had attempted to steer clear of the Merlin, but was struck on the port side. 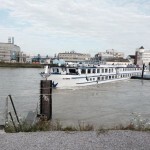 In this attempt, the Olympia then struck into the side of the moored passenger ship Lafayette. 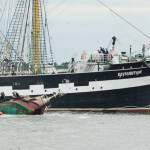 Both vessels sustained some hull damage and the Olympia later reported a leak and some water ingress. The 50 passengers on board the Olympia and the 100 passengers on the Lafayette were taken ashore while both vessels were inspected. No reports of injuries. 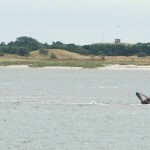 Authorities were able to secure the overturn Merlin and secure it to the shoreline. 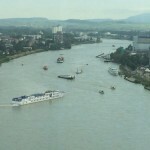 Reports state there was some pollution released into the river as some diesel fuel spilled from the Merlin. No reports of injuries.